If you want to do conformation shows, sieger shows, club matches, breed surveys, etc. with your beautiful German Shepherd Dog, you and your dog do need special ringtraining. 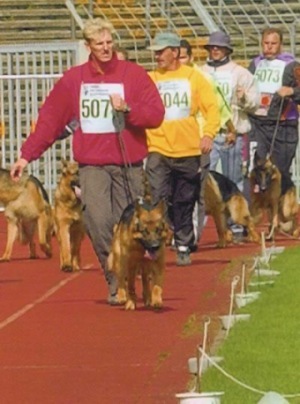 Therefore some Schutzhundclubs offer special trainingposibilties to prepare the dogs and their handlers for these events. Good and professional ring training is absolutely necessary if you want to prepare yourself and your dog for a show or breed survey. Working in the is not hard to do for a German Shepherd Dog. They just walk, run and stand still to show their best exterior qualities. The most important thing is the experience of the dog and his handler. The dog has to experience what´s being asked from him in the ring. He has to experience what´s it like to walk in the front, middle or back. The dog also has to learn to have his teeth, ears, etc. checked by a total stranger. A lot of practicing makes that the dog feels at home in the ring and that´s a crucial factor to perform well in the ring. Except practicing walking and running in the ring, the dog has also to learn to work with a unknown handler. In most cases the dog will present itself much better with a (good) unknown handler then under the guidance of his owner. To the handler ring training is just that important. He or she learns what are the best ways to present a dog to the judges and the audience. To play the game of a show successfully, the handler has to keep an eye on the judge under all circumstances.